The llama is only one of four South American Camelids. The llama and guanaco are the larger of the four and the alpaca and vicuna are smaller with more wool. Depending on the source, the vicuna is sometimes reported as Vicugna vicugna instead of Lama vicugna. 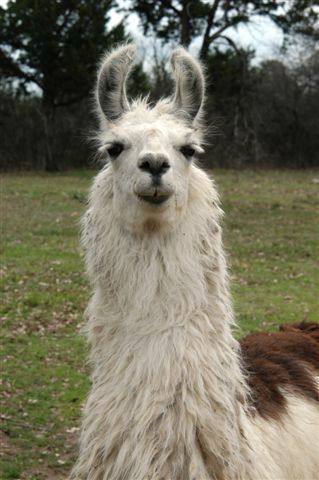 The term lama is sometimes used to include both llamas and alpacas with one word and should not be confused with a spelling error of the word llama. Color. Llamas come in a variety of colors. They can be various shades of brown, black, peach, white, grey, roan, paints, spotted and many other patterns. There is less color variety in alpacas because they were bred to have a single uniform color to produce a consistent product and ease the harvesting of wool. Alpacas can be found in black, browns, grey, white or white along with another color. Reproduction. Llamas and alpacas are induced ovulators and only have one cria for each pregnancy. Crias are weaned between 4 and 6 months of age. Females are bred for the first time between 18 and 24 months of age. Males begin breeding between 24 and 36 months of age. Llamas usually guard sheep, but they have also been used to guard geese, ducks, deer, and cattle. Llamas have a natural guarding instinct and require no training to become an effective guard animal. Llamas have a natural coyote-like predator in South America and have evolved to be instinctively wary of canid (the dog family) predators. They also quickly adjust to being with sheep instead of llamas. It only takes them a few hours to a week or two to complete the adjustment period and become part of the flock. Llamas are clean and finicky animals and prefer to graze, lay, breed and roll in areas free of urine and feces. Creating dung piles enables them to this. It also means that llamas can be brought indoors for parties, nursing homes or handicapped people without the risk of accidents. Dung piles are what makes llamas well suited for outdoor activities like packing and golf caddies. They will not randomly go to the bathroom on the trail or the golf course. The golf courses which allow llama caddies provide dung piles in a few areas along the course. Clean up becomes much easier at the golf course and along the pack trail.